It’s been interesting seeing how Vince Gilligan and Peter Gould utilize the cold opens on Better Call Saul in a different fashion than they did on Breaking Bad. Whereas, the cold opens on Breaking Bad were mostly served as flash forwards that teased events to come, Saul has frequently used flashbacks in its beginnings instead. While the two shows share similar writing and directing rhythms that link them together, the difference in the cold opens is indicative of the ways they stand apart. Breaking Bad used its flash forwards as a lingering omen that suggested its story was pre-destined and these characters were driving toward an inevitable fate. On the other hand, Better Call Saul’s use of flashbacks serve as pockets of the past informing how much these people have changed, while also suggesting that their lives could experience a cyclical effect. The blue-tinged flashback featured in “RICO” went back to James McGill’s early days working at HHM as a simple mailman who is often invisible to the lawyers working around him. The reactions that he gets from Chuck, Kim, and Howard after they learn that he has passed the BAR test, are particularly telling of the relationships they all share in the present day. Kim and Jimmy’s relationship, and this flashback finally confirms that they did in fact have an intimate relationship, has frayed over time but she still believes in him, which coincides with the ecstatic congratulation she gives him. Chuck, meanwhile, is certainly happy that his brother managed to do all the work by himself and is pursuing this dream, but there’s a sense of apprehension to Chuck’s response. 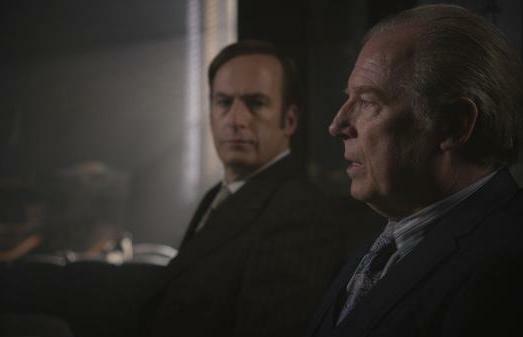 Michael McKean is so perfectly able to subtly blend and express Chuck’s conflicting feelings that less observant viewers might easily overlook. Saul has often played its character beats in a more muted fashion than the exposition-heavy style of your average television writing, and in this episodes case, one of these moments is literally played that way. As Kim and other co-workers celebrate Jimmy’s achievement with a little party, Howard interrupts to have a word with Jimmy about it alone. Rather than cut to inside of Jimmy’s mail office for the conversation, director Colin Bucksey holds on his camera’s view through the window even as the closed door shuts out all sound except for the repetitive drone of printing paper. The uneasy quiet allows dread to set in on the scene; we instinctively know through Jimmy and Howard’s antagonistic relations that Howard is dashing all of Jimmy’s hopes to work alongside his brother at the company. Howard is otherwise an unseen presence in “Rico” outside of this opening, and yet there’s a lingering feeling that he isn’t done tearing down Jimmy’s accomplishments, maybe even in the near future. Jimmy’s recent commitment to elder law in the present leads him to widespread fraud being committed by the SandPiper retirement home, and his committed investigation convinces Chuck to help out. Chuck gets so wrapped up in the fraud case with his newfound drive in life that he walks outside without any hesitation. It’s only once Jimmy calls out to him that he realizes where he is; time slows down as Chuck gazes around, shocked, in the bright sunlight, his “condition” seemingly lifted. Since the beginning this show has toed a line of amusement in its characters’ plight and has just stopped short of laughing at them. Chuck’s imagined symptoms could have easily been played for cheap chuckles in the hands of less-skilled creators, but Gilligan, Gould, and McKean have found the sympathetic humanity in Chuck from the start, along with the sometimes uneasy bond he shares with his brother. Jimmy too is privy to this with the writers. “RICO” finds the character in a humiliating low when he goes dumpster diving and gets trash dropped on him by the two SandPiper guards who manhandled him earlier. Better Call Saul often puts its lead character through the ringer, between this and the indignity he receives from those around him, but McGill isn’t written as a joke himself, and the show takes his motivation to be a genuinely good person seriously. He’s certainly a character to be laughed with though, especially with Bob Odenkirk delivering the cracking dialogue week after week. August is a 23-year-old aspiring film critic and college graduate in Film/Media who hails from New Jersey. He began developing his taste and passion for film after starting high school, and just in the past few years has gotten back into television too. He also enjoys a good video game every now and then too when he isn't doing a Netflix marathon or keeping up with news in the entertainment industry. Often finds himself collecting books and comics more than he actually reads them. He started his own blog for film reviews entitled License to Review, on account of James Bond being his favorite series and character, and then followed that up by becoming the Entertainment Editor at his college newspaper. Ask him what his favorite anything is and he'll immediately jump to Aliens, Seinfeld, Led Zeppelin, and everything from Blizzard Entertainment and Naughty Dog. Next ArticleAgents of S.H.I.E.L.D. 2x14 "Love in the Time of Hydra"